Imagine what it would be like to be in a relationship with someone whose vision of you is so overwhelming, that it seems as if you don’t really exist. You can’t be heard or seen. You are constantly misunderstood despite your attempts to explain your thoughts and feelings. Yet this person, the narcissist, your partner, claims to know you better than you know yourself. The beginning of your relationship was like nothing you had ever experienced before. You got along so well, talked about problems with ease, shared yourself without fear, and resolved issues with respect and understanding. Then seemingly out of nowhere everything changed. For me, my “soul mate” disappeared after just 3 months. He went from everything I’d ever wanted to a hateful monster almost overnight. We become confused when this change occurs. We wonder what we may have done to make the man we love become so angry at us. Why did he suddenly become mean and aggressive, accusatory and manipulative? While this change seems sudden to us, it actually was there the entire time just beneath the surface of his nice guy act. So how did your relationship go from healthy to abusive? The narcissist felt secure. He felt so secure that he hooked you that he was able to let his mask slip or even fall off completely. He knew you had fallen for him and believed he was a great guy. He knew that if he began abusing you, emotionally at first with little white lies, guilt trips, and some name calling here and there, that you would still be there. You would stay, waiting for your dream guy to return from the dark side. And of course the narcissist would return to his prince charming act and you would breathe a sigh of relief, assuring yourself that it was just a bump in the road. There was nothing you two couldn’t get through. The cycle of narcissistic abuse will take over the relationship. Things will be bad and then good and this will repeat over and over again, unless you end the relationship. The emotional and verbal abuse will be done to brainwash you. It will strip you of your self-worth, trust in yourself and others, and crush any bit of confidence you have. 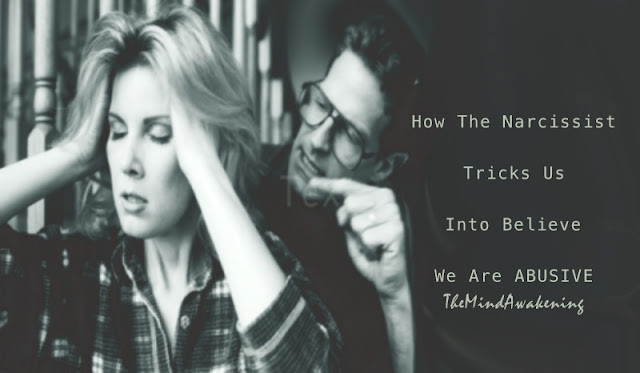 The narcissist takes everything from you by belittling you, intimidating you with threats and aggressive behaviors or under the ruse of guiding and teaching you. The constant insults, insinuations, and false accusations are so insidious that you won’t realize what is being done to you until it is too late. Gone is the vibrant woman the narcissist “fell in love” with and declared his soul mate and love of his life. That woman has been replaced with a self-loathing, insecure, indecisive woman who can no longer judge situations realistically. A woman who blames herself for the abuse and only wishes she could somehow get her partner to love her again. She vows to be the best partner she can be. She strives for perfection and believes that if she could just keep from upsetting her narcissist that everything would be alright. He would love her again. Trying to be the perfect partner to avoid narcissistic abuse never works. In fact, it only makes the narcissist angrier as he will see you trying to be happy and trying to make him happy, so he will need to put an end to this. You aren’t allowed to be happy and the narcissist will do anything to get you to crumble. They want you to react to their abuse with anger. They want you to get mad. They NEED you to yell and scream. They need you to defend your position so they can knock you down by claiming you are the abusive one. The crazy person. If you bring up an issue with the narcissist do not expect any type of resolution. The narc will use decoy arguments to invalidate his partner. You will bring up an issue and the narc will bring up another event to distract you. So you will go from trying to discuss something that is currently bothering you to arguing over a past event that has nothing to do with the current issue. You will never win when dealing with a narcissist. The minute you get angry, even if it you only got really angry one time, the narcissist will use that one time to remind you that you are the abuser and they are the victim. They will remind you that you also yell and scream. They will remind you that you called them names as well. They will bring up that one time you pushed them (which you did because you were trying to get away from them.) They will bring up a lie you told and from then on you will be called a liar, even though they lied continuously and you have caught them. The abusive narcissist is smart, cunning, and able to manipulate his way through life. He gets want he wants by taking from others. He is a soulless predator who gets high on hurting others. To the outside world he is a charming, sweet guy. A devoted father and husband who loves his wife. Behind closed doors he takes off his mask of wholesomeness and allows his true self to come out.